With fall break here, it is the perfect time to binge-watch a tv series over the long weekend. 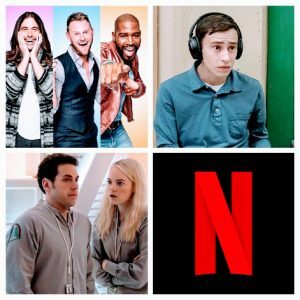 There is no shortage of good tv shows to add you your watch list, but “Atypical,” “Queer Eye” and “Maniac” should be at the top. “Atypical” is a quirky TV show that follows Sam, a boy with autism, and his family’s lives. Their depiction of autism is honest and humanizing. Sam is relatable, pushing open mindedness onto the audience. It destigmatized the stereotypes that surround autism, all while navigating teenage life. Each character has so much depth and intrigue that keeps the audience on the edge of their seats. The Netflix original’s second season got released early September and continues to design interesting and original, yet still realistic storylines. The comedic awkwardness in the show makes for cringe-worthy, but hilarious and relatable episodes. For anyone going home for the weekend, it is a family show that has engaging humor for all ages. In the new release, “Maniac,” starring Jonah Hill and Emma Stone, the audience is taken on a trippy ride through the human conscious. Owen, played by Hill, and Annie, played by Stone, take part in a pharmaceutical trial that claims to fix all problems in the mind. Owen, who comes from a wealthy family, struggles with schizophrenia. On the flip side, Annie, raised in poverty, suffers from depression and anxiety. The duo maneuver, with difficulty, through the trial’s dreamworld which is created through the user’s thoughts, fears, and mental disorders. For anyone interested in a gripping, mind boggling weekend, give this show a watch. The show was created with the intention of only being one season. It is ten episodes, so the time commitment would be prime for the break. “Queer Eye,” a reality show, follows five men known as the Fab Five. The zany group keeps the audience gripped in the theatrics of their lives. The group aids those in need of rejuvenation through five specialties: wine, interior design, grooming, fashion and culture. It has it all: humor, love, drama, diversity and authenticity. The five men, as assumed by the title, are all members of the LGBTQ+ in one form or another. This diversity brings new perspectives that have not often been showcased in America. Despite being a lifestyle reality, there is an abundance of political discourse because many clients disagree with the Fab Five and their beliefs. Each man has their own vibrant personality and it is impossible to resist their charm. “Queer Eye” won three out of four Emmy nominations in this year’s award show. It just got cleared for its third season which does not have a release date, but is projected to come out the summer of 2019.